This is your chance to drive the tractor and park it! Could you believe that? Duh! So, as you have already understood the main thing is not to make a crash and follow the arrow, park it as better as possible. Use the arrow keys and become the winner of the game! 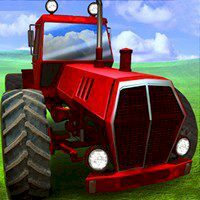 Have you ever dream to have a real tractor? Well, in this game all your dreams will come true! Just prove your worthy enough to go into the parking business! You have to really carefully navigate your way through your farm and park your tractor into the spaces that are marked. Of course, try not to crash or you will damage your vehicle and you will have to start from the beginning! If there is no more questions, then use all your skills and park it like a professional! We know that you can cope with it, just try it! Have a lot of fun!